UPDATE: Sorry guys, our readers pounced on this one and the coupon is sold out. We’ll keep an eye peeled and let you know as soon as this model goes on sale again. EARLIER: Did you know that Instant Pot made a multi-use cooker with a built-in sous vide function? If you didn’t, we’ll pause for a moment so you can collect your thoughts now that your mind has been blown. You good? Well we hope you’re sitting down because we have even more exciting news: it’s on sale right now on Amazon at its lowest price ever. 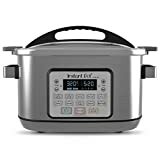 The $160 Instant Pot 8 Qt Aura Pro Multi-Use Programmable Multicooker with Sous Vide is worth every penny and then some at its full retail price. Clip the $32 coupon on the Amazon page, however, and you’ll pay just $127.99. That’s an all-time low by a big margin, and it’s a deal that definitely won’t last long.